The Tasmania Distillery was famously named as the producer of the world's best single malt whisky; Sullivan‟s Cove at the World Whiskies Awards 2014 in London. Now they have gone one step further with this magnificent 14 year old, limited to only 100 bottles worldwide and matured in French oak casks. Made by traditional methods using only Tasmania ingredients, it is not chill filtered nor are any flavours or colours added. Their whisky is the quintessential small batch luxury whisky. Sullivan's Cove was the settlement that eventually grew in to the city of Hobart and where a penal colony was established in 1803, taking convicts from the earlier penal colony at Botany Bay (now Sydney). In 1812, Indefatigable became the first ship to sail direct from Britain, landing 200 male convicts on 19 October. This whisky has been bottled in commemoration of this epochal event. 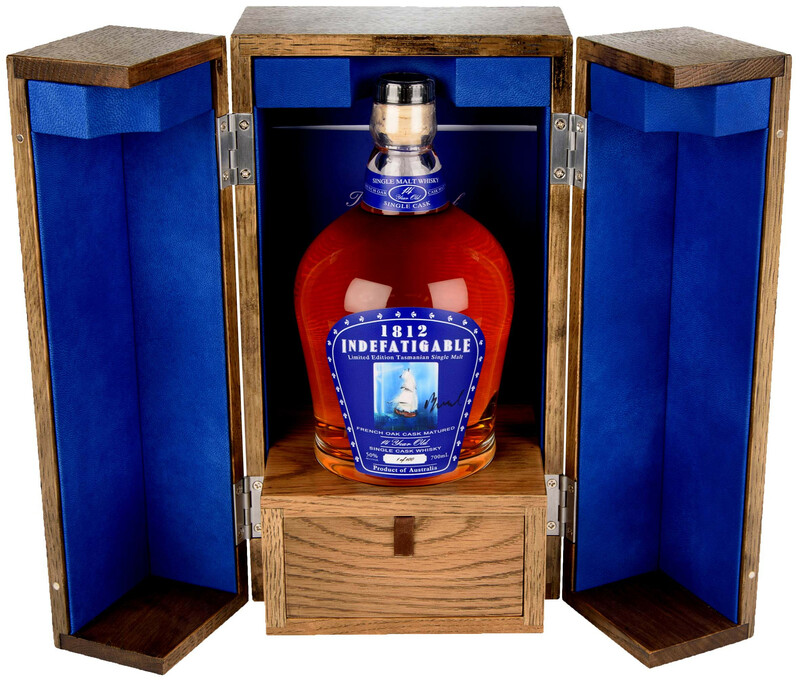 Each bottle of 1812 Indefatigable is made from the finest hand blown crystal and comes in a bespoke distressed oak presentation chest with a solid Irish silver stopper to replace the transit cork once it arrives with the client. The label design is adorned with a painting by renowned Irish artist Brian Maguire who has signed each one, with each component of 1812 Indefatigable whisky individually numbered from 1 to 100. Drink it or collect it, this is a unique opportunity to acquire a fantastic whisky. Due to the high value of this whisky, there is a two week lead time from ordering to delivery.